Mutton curry from India normally uses ground black pepper in the early stages of the sauce. The peppers help to soften the mutton, and lend subtle warmth at the front of the mouth. Peppercorn sauce for meat stems from France, but can now be found in steakhouses the world over. A pepper sauce purist will insist on leaving a few whole peppercorns in the sauce for an extra hit during the eating, but it’s acceptable to serve the sauce using solely ground pepper. Beyond that, there is not much difference between the two. 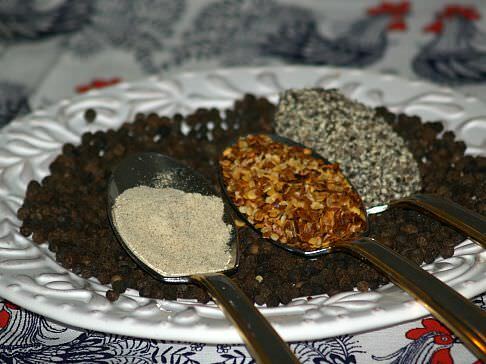 Most recipes you’ll use when cooking with pepper will only ask for one or the other, but they can be used interchangeably. 2 tablespoons of green or black peppercorns. If you don’t like your sauce to have a big pepper kick, grind the peppers first. For a better sauce, use the best spices you can find. Heat the cream over a medium heat until it starts to bubble, making sure that you don’t let it come to the boil. If you want a cooler sauce, strain the peppercorns before you serve. When you know the right recipes, cooking with pepper can help you become a little more creative in the kitchen, and will open the door to a whole world of new recipes. Combine and blend in small bowl the garlic, tahini, chili oil, ginger, soy, sesame oil, sugar, vinegar and peppercorn; set aside. Place chicken in heavy skillet; cover with water and simmer. Cook until firm and all pink disappears; remove from pan and cool. Cut chicken breast in halves; cut each half diagonally into thin strips. Mound fresh clean and dried spinach on 2 plates; top with chicken strips. Spoon peppercorn sauce over chicken; garnish with cilantro and serve.